Governor Nyesom Wike has reappointed Hon John Wokoma as the Caretaker Committee Chairman of Emohua Local Government Area. Hon Wokoma who was among those recently dissolved by Governor Nyesom Wike last Month was reappointed due to his Track records in the Area of Security in Emohua Local Government Area few months he held sway to the Leadership of the Council. 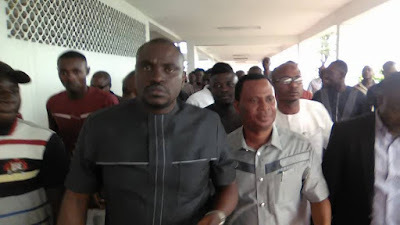 Those who were reappointed Included Hon Samuel Nwanosike who is now a Three Times Caretaker Commitee Chairman of Ikwerre Local Government Area and Hon Collins Onunwo of Obio-Akpor Local Government Area. The Rivers State House Of Assembly Screened and Confirmed the Nominees sent by Governor Nyesom Wike yesterday.